Last week in school, Virgil and his second-grade classmates read Snowflake Bentley. Virgil’s teacher, Mrs. Martin, described the book this way in her weekly report to parents: “The story is about an enterprising Vermonter who in the late 1800s perfected the art of photographing ice crystals using a special camera that could magnify the images.” Mrs. Martin had Virgil and his classmates fold and cut eight-sided (octagonal) snowflakes, even though Wilson Bentley’s photographs were the first to show that snowflake crystals are six-sided (hexagonal). 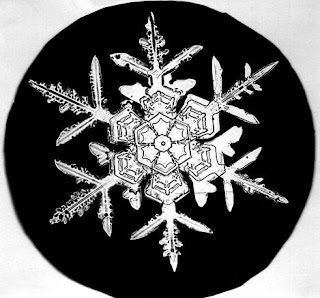 People made fun of Wilson Bentley for his snowflake obsession, but he eventually became known as the world’s expert on snowflakes. Over nearly 50 years he took 5000 photomicrographs of snow crystals — an unequalled collection that continues to be studied and admired around the world. Thanks to “Snowflake” Bentley and that collection, we learned what every second-grader now knows: that no two snowflakes are alike. 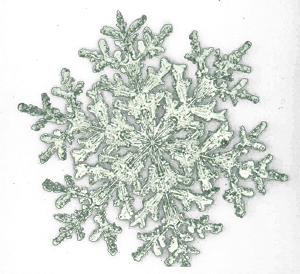 • One snowflake can consist of many ice crystals. The six-pointed structure of ice crystals gives snow what scientists call an “ice skeleton” — a loose scaffolding of crystals around a relatively large volume of air. When snow falls to the ground, the air in those spaces becomes trapped beneath other layers. Newly fallen snow can be 90 to 95 percent trapped air. • A fun and easy way to demonstrate the ratio of air to snow in a fresh snowfall is to squish a loaf of light bread down as far as possible. (Wonder Bread works great for this — it has about the ratio.) If you work hard at it, you should be able to compress the loaf into a two-inch cube. • When we walk on new snow, it makes a crunching sound. Our weight compresses the snow, which pushes the air out of the crystals. The sound we hear is the sound of breaking crystal .... snow crystals. 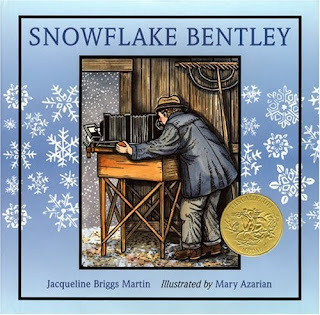 Snowflake Bentley won a Caldecott Medal for its woodcut illustrations, which were created by another famous Vermonter, Mary Azarian. The book’s website includes many links to curriculum suggestions and activities for teachers and parents.